Welcome to the autumn newsletter. 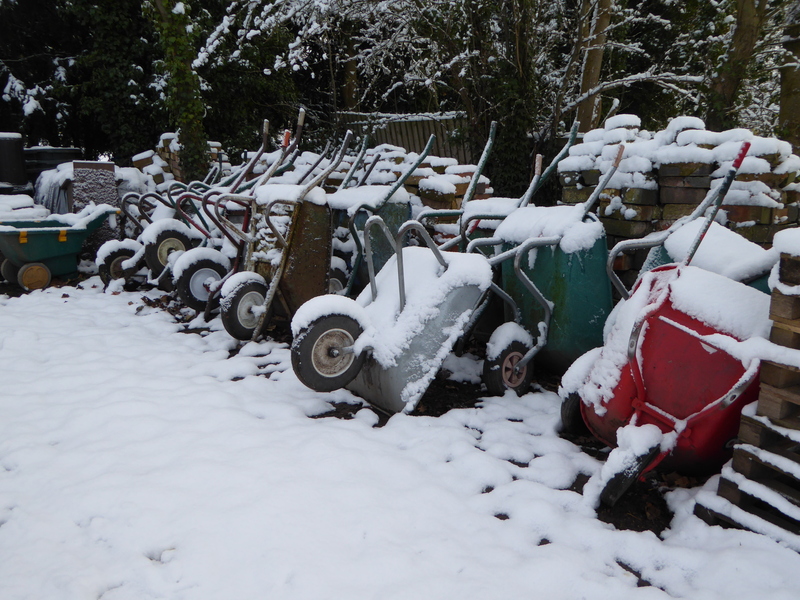 The days are shortening, the first frosts of the winter have arrived and it’s tidying up time at the walled garden. As I write, most of the leaves have fallen – creating plenty of opportunities for enthusiastic raking so that we can compost the leaves for future use. Most of the harvest is now in, but there is no shortage of jobs to do in preparation for next year. No time to get bored then! 2017 was another great year for the walled garden – at least, according to the Royal Horticultural Society, who awarded us a Level 5 Outstanding certificate in their 2017 ‘It’s your Neighbourhood’ competition. It’s good to get confirmation from the experts that we are doing a good job. 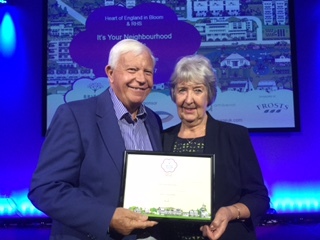 “We felt very proud to be receiving the award for Elford Gardens. It was so interesting to see how groups of people could come together to build gardens and this also helped them to build new friendships, just like we have found since joining the project and we recommend it to anyone who would be interested in volunteering like us’. On the ‘engineering’ side of things, quite a lot has been happening since I last wrote. 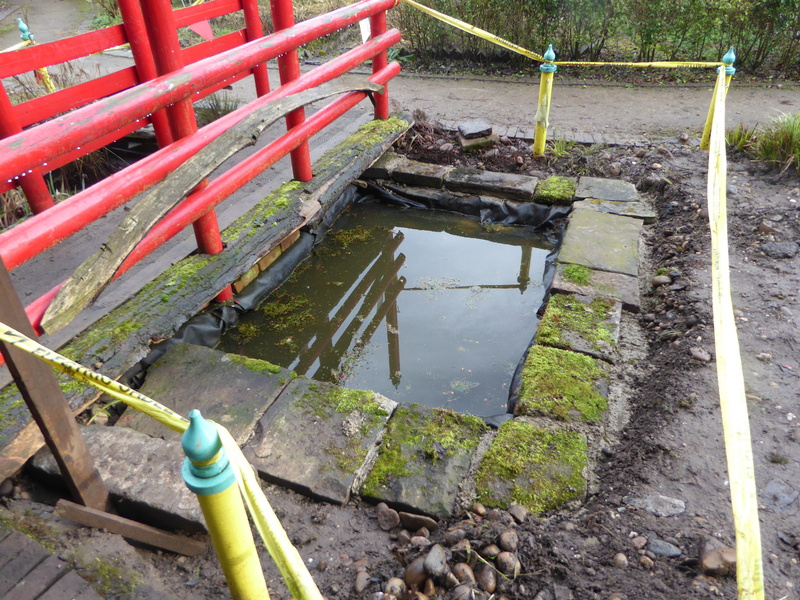 At the rear of the gardener’s house, part of the leaking outhouse roof has been replaced – work in progress! Also in progress is the rebuilding of the sash windows in the house. 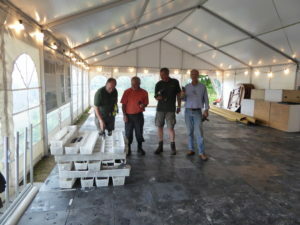 This is slow work requiring a good deal of expertise from Steve Eyley and Dave Watton. All of the house windows needed rebuilding but there are only 3 left to do! With the final bedroom now finished, we will just have the stairs and landing left to do this winter – a job for when the weather prevents us from tackling outside jobs. 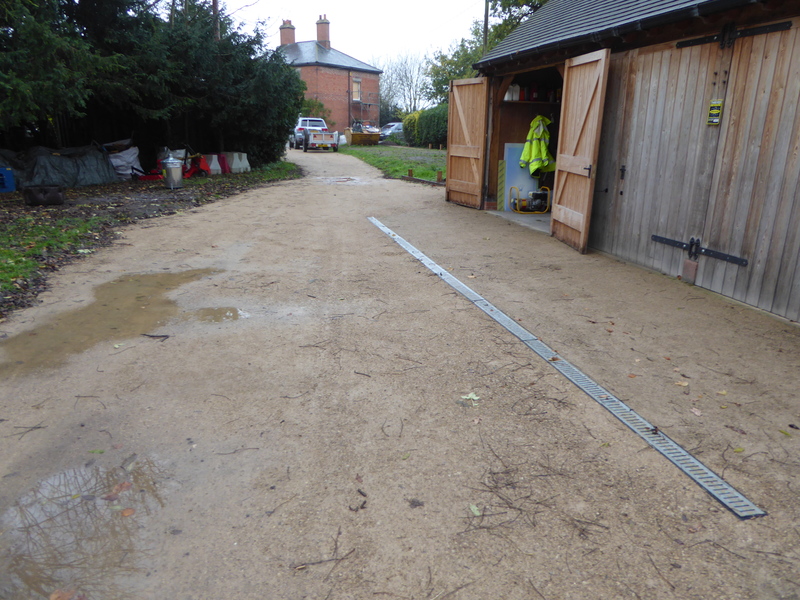 A lot of work has gone into tidying up the area around the barn. The large pile of logs has disappeared, a new limestone chip surface has been laid between the house and the paddock, a new path has been laid by the hedge and the large area between the house and the barn has been seeded with wildflowers and should look a picture in 2018. The dogwoods planted by the barn have settled in well and now look a picture. New visitors to the garden? 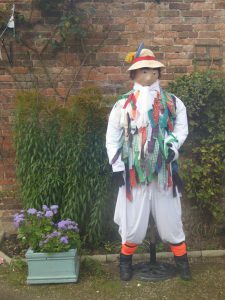 The Village Scarecrowfest in August bought many new visitors to the walled garden and a few of them liked it so much that they stayed on! We always benefit from the Scarecrow Festival as new people discover the garden for the very first time and lots of them return for a second visit – and often bring friends along. 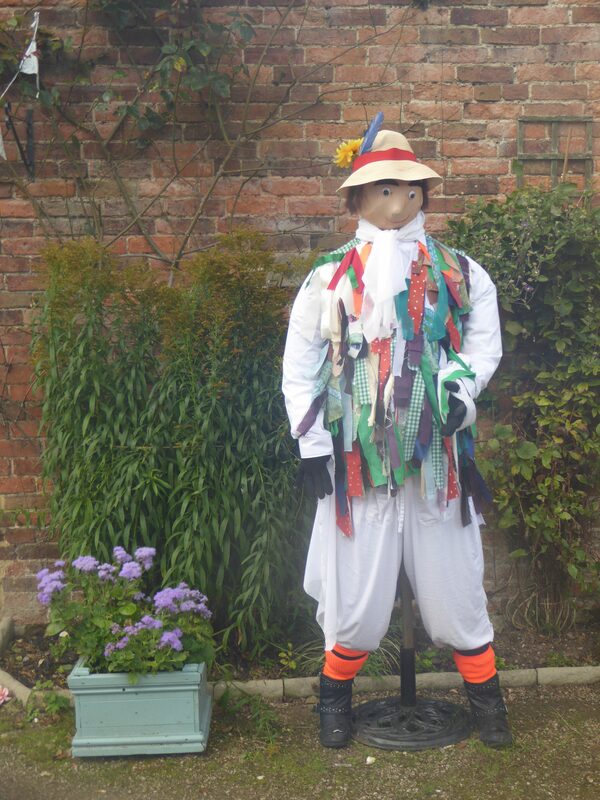 We also provide a space for some of the scarecrows once the festival is over. 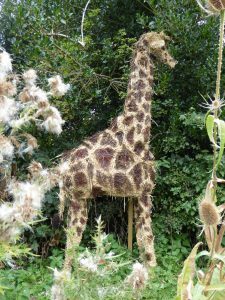 This year, if you look hard enough, you can find a giraffe, a gorilla, a snake, a rather large serpent and the Gruffalo all lurking in the gardens. The Incredible Hulk has returned (in a new disguise) to guard our back gate and ‘Morris’ is keeping an eye on our front gate (below right). You’ll also find some of the several scarecrows produced by Sue Watton, our very own scarecrow construction machine! What a fabulous year 2017 has been for fruit! 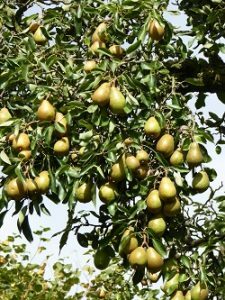 We’ve had a terrific cropping year for all of our tree fruits in the orchard. First came a heavy crop of plums and greengages, then trees groaned under the weight of apples and pears. 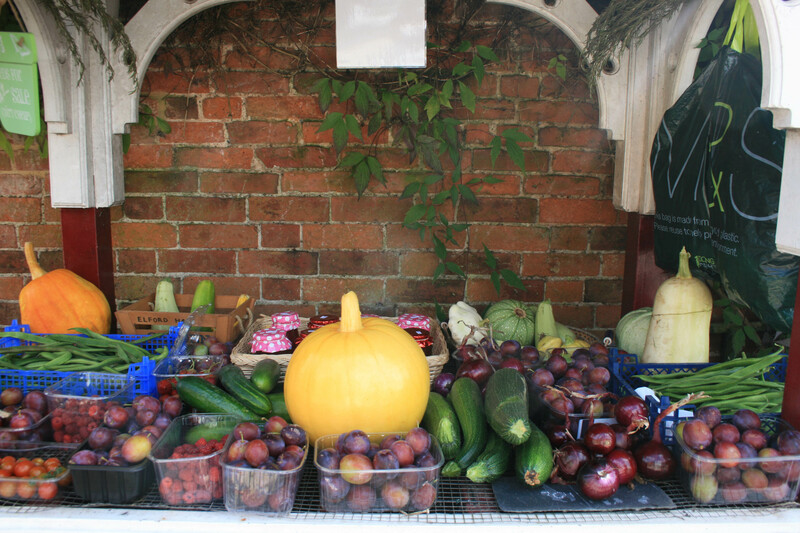 The produce table has been full of fruit all autumn! There are a few winter vegetables still to harvest so come along and share in Nature’s Bounty while you can! Above left is ‘Marino’s vine’, grown from a cutting given to us by Marino Rosa and fruiting better than ever this year and rambling beautifully over the pergola in the sensory garden. Above right is one of the mature pear trees growing in the orchard and giving us the best crop we have seen since 2009 when we began work here. The pears are difficult to harvest with the tree being so tall but well worth the effort – they are delicious! Not much of our fruit goes to waste. Volunteer Frank Wood is a skilled cider maker. He is turning our windfalls into cider (which will be available at the Beer Festival in 2018) and also he ran a day of apple pressing at the garden. The fresh juice was just amazing! Some of his cider has been on sale at the Crown so you have a chance to try it out – it’s well worth it! Much of our soft fruit has been turned into some 200 jars of lovely jam by Jean & Ron Chamberlain and by Chris King and others. This has been on our produce table, raising valuable funds to keep the project going. Thanks to them all. 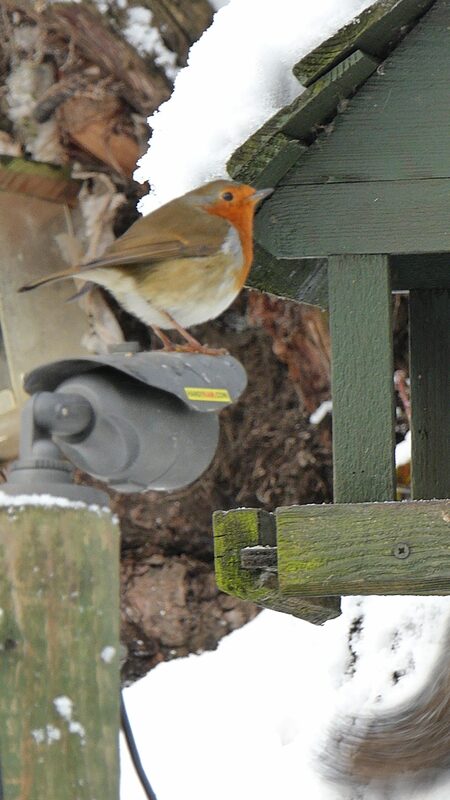 Ron & Jean also keep our bird feeders well stocked – what stars they are! Behind the gardener’s house, Thelma has been busy propagating. Her green fingers have produced a stream of young plants for the produce table and which prove popular with visitors. With help from Barbara & Mike, they have turned the rear garden into something approaching a mini garden centre. 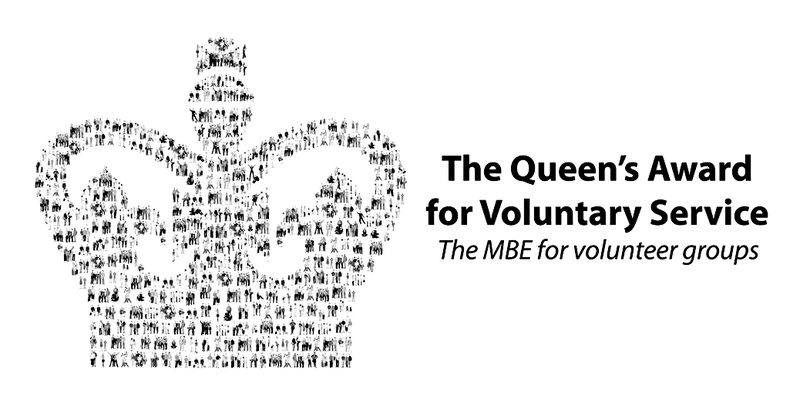 Following the questionnaire completed earlier in the summer, we have been fortunate in attracting 3 new trustees to the board. Ben Crutchley and Ursula & Colin Middlemore have kindly stepped forward to help guide the project through the next 10 years and they will, no doubt, be valuable assets. 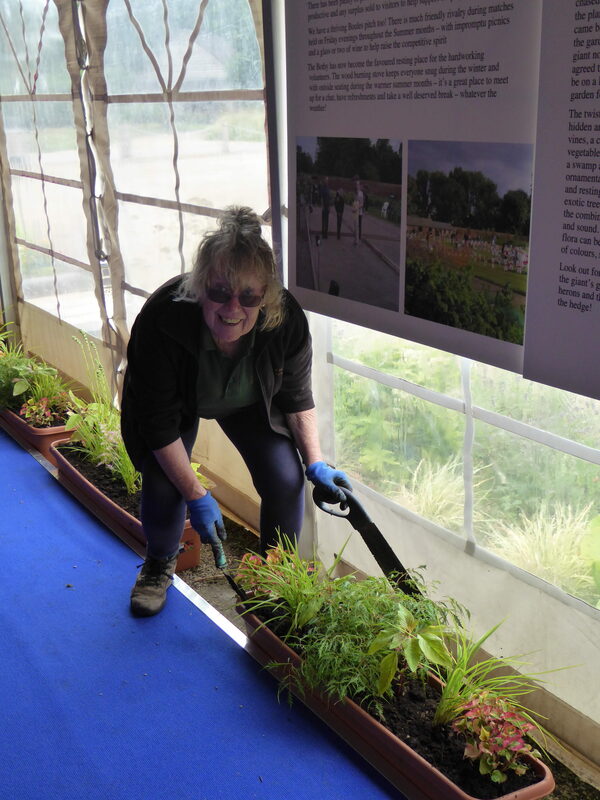 Avril Commons, one of our original trustees has stepped aside this year but will maintain a close contact with what’s happening at the garden and be on hand with advice, as will Angela Cornell who has retired after many years of valuable service as treasurer. Our grateful thanks go to them both – they will be missed. Angela’s duties have been taken over by Phil Clayton and we wish him a warm welcome to the team. The new trustees will help to formulate the plan for the next 10 years at the garden. The village questionnaire has given us lots of good ideas to consider over the next 12 months and we hope to have the next phase planned out in time for 2019 when the current 10 year plan expires. 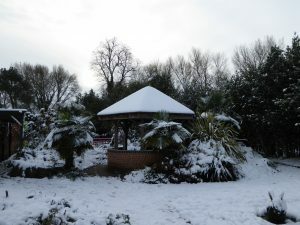 The walled garden is a facility available for the whole village to use. In the house we have the swapping library – bring along a book and swap it for another, or take away a book and leave a small donation. The front room of the house is also available for people to use as a meeting room. 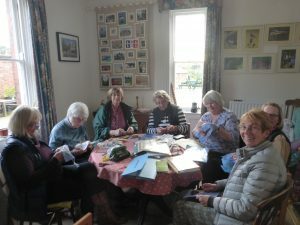 It’s already being used by a village needlework group (see picture below) and could be used by you – there is no charge. The marquee is available for a donation too! 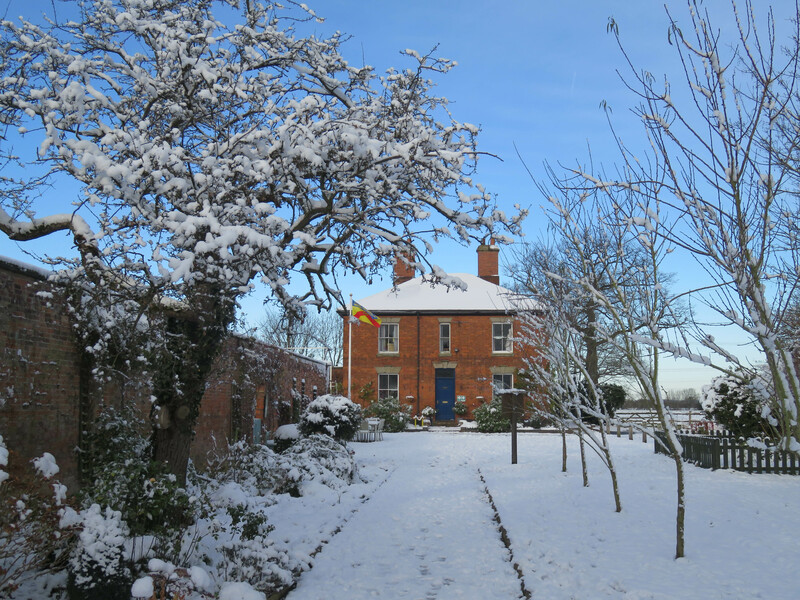 Let us know if you want to use the house during winter so that we can turn on the heating! 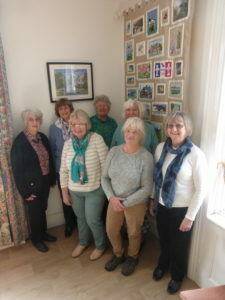 A new group is emerging with a bit of history attached, and by that I mean that they are interested in researching things relating to Elford village history. 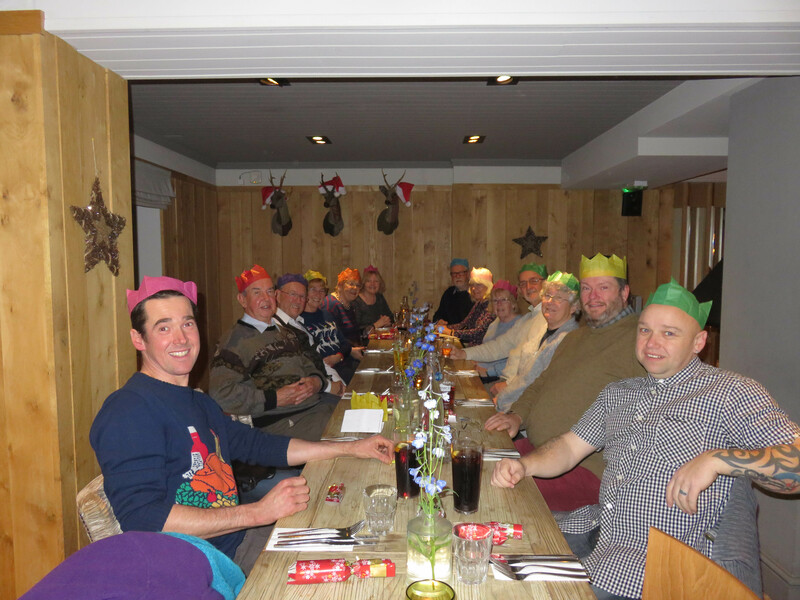 After holding a preliminary meeting, the group will meet again on November 22nd in the Village Hall at 7.30pm. To find out more, speak to Greg Watkins or Sue Robotham. We’re hoping that the group will discover more about the Walled Garden and the Elford Estate to fill in the gaps in our history. Plans are in hand to recreate the Nativity ‘live’ on Christmas Eve at the walled garden stable. This will be a great treat for everyone so be there if you can make it. Welcome to the post beer festival edition of the Walled Garden Newsletter. The early spell of warm and sunny weather has really made the garden bloom and the more recent deluges have seen the growth continue a pace (though not without the odd bit of rain damage). 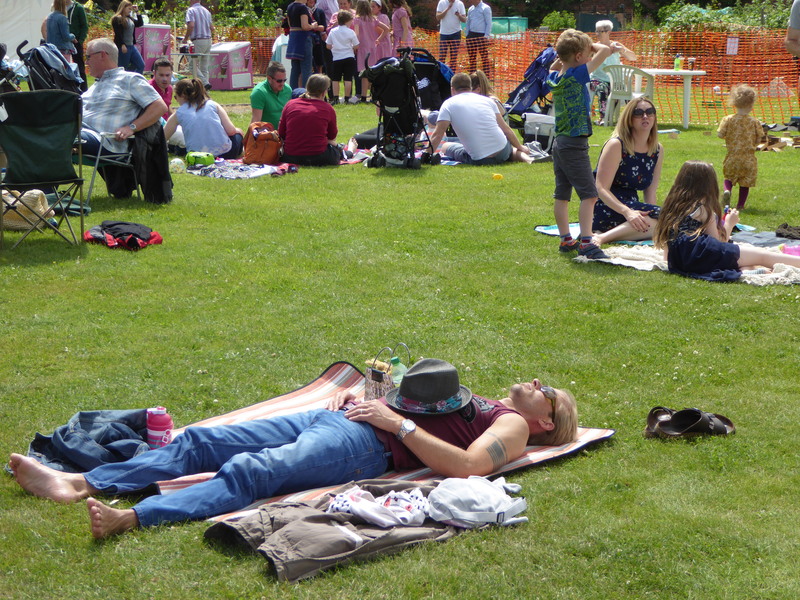 The good weather held over the two weeks we spent preparing the site for the Real Ale Festival and on the day itself, the sun shone warmly and blessed the event with perfect picnic and relaxing conditions for the many visitors that enjoyed the day. 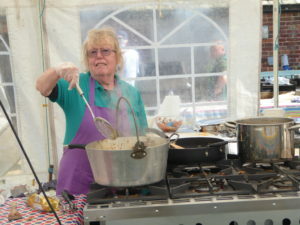 So let’s start with a few words about the excellent Family & Real Ale Festival which took place on July 1st this year. As usual, lots of people put in a lot of hard work to put these kinds of events on. 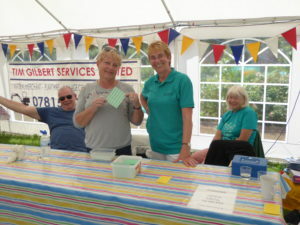 Villagers step forward in numbers to help stewarding on the day (and clearing up on the Sunday) and lots of people turn up to create a wonderful atmosphere in the beautiful setting of the walled garden. Without YOU, these events could never happen, so grateful thanks to everyone. 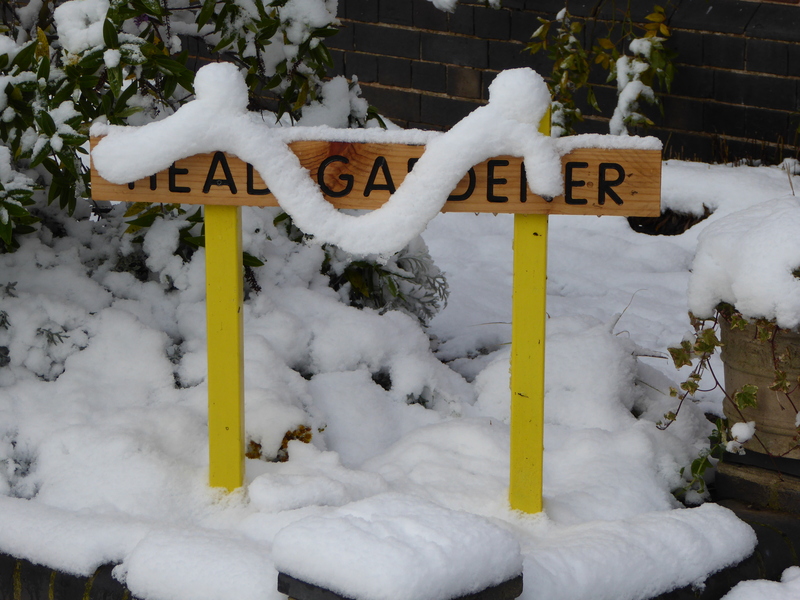 Together, we have managed to raise almost enough money to keep the garden running for the next 12 months so it was a great success on all fronts! 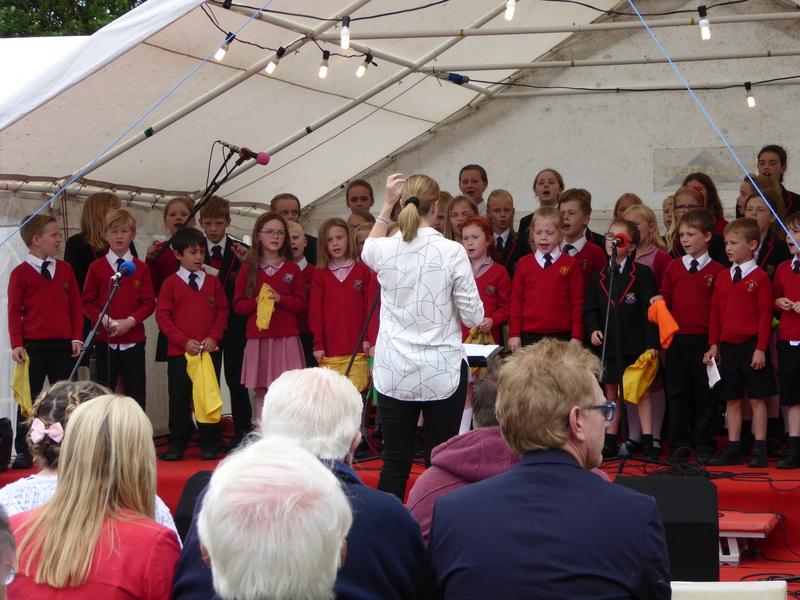 Once again, the event was kicked off by the Small Schools Multi Academy Choir, ably led by Sally Parkes. They were larger in numbers this year and got the event off to a great start with lively music and excellent solos. Music continued to flow from 1pm ‘til gone 10pm with choir performances by ‘Local Vocal’ from Tutbury and Tamworth Voices, some excellent and varied ‘jazzy’ music from Blast Off, Vintage Rhythms Collective and the brilliant Quartet Saxophone Ensemble. Classy Spotlight provided a barbershop treat and headliners Brindley-Hunt gave their usual high quality and much appreciated performance. The event was drawn to a close by the Walled Garden Wailers with their unmistakable brand of ‘pop through the ages’ which seemed to go down really well this year (we might even be improving!). The music was kept flowing thanks to the excellent work of Ryan & Jason. All of these performers give such a lot to make the event the success that it is and all give their services and skills free of charge. Thanks to you all. Round and round the garden …..
Summer is always a busy time at the garden and it’s hard to keep up with the growing grass and the amazingly robust weeds. As you focus on one job that needs doing, other jobs spring up behind your back to catch you out. What fun! 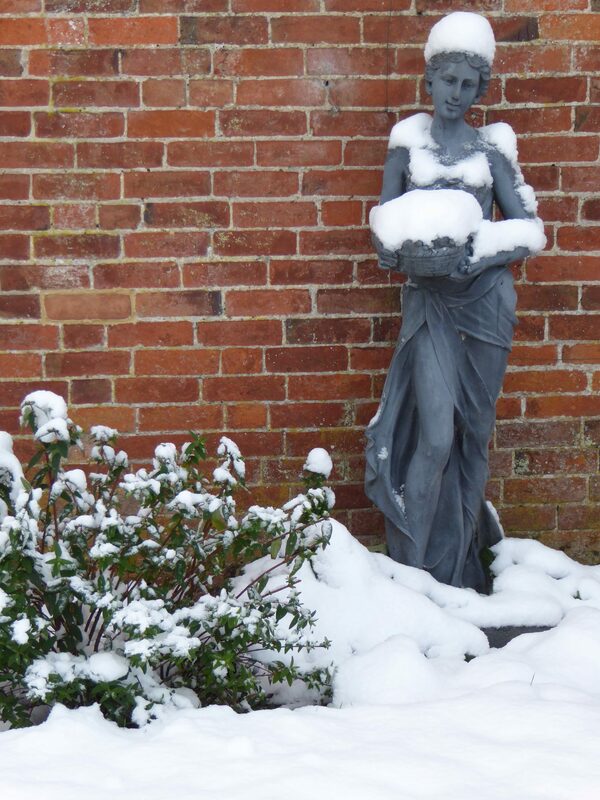 Despite this, the garden has looked lovely. The rose garden and the herbaceous border have really come into their own and the raised bed by the Vine House has been a picture. After a slow start, the Giant’s Garden is now really filling out and towering over the heads of visitors. The orchard trees are heavy with fruit and the first plums are already being harvested. The allotments look great and the soft fruit harvesting is keeping volunteers busy and the vegetable crop is now being harvested so there will be plenty of fresh fruit and veg on the produce table from now on. There are always lots going on in the garden department with many hands making work lighter. We’re always happy to see new volunteers and since April, Roy and Faye have joined us and are proving to be worth their weight in gold! Elsewhere, Harvey Sutton joined us while preparing for his Duke of Edinburgh’s Award bronze and here he is (above) finishing off a bed of dogwood shrubs that he and Roger created next to the barn. Hopefully, he’ll be back when he does his silver! Currently we have Hannah Brayer pursuing her bronze and Harry, Kit and Toby back with us as they prepare for their silver. It’s great to have younger people involved in the project, even if it’s only for a short while. Their help is much appreciated. 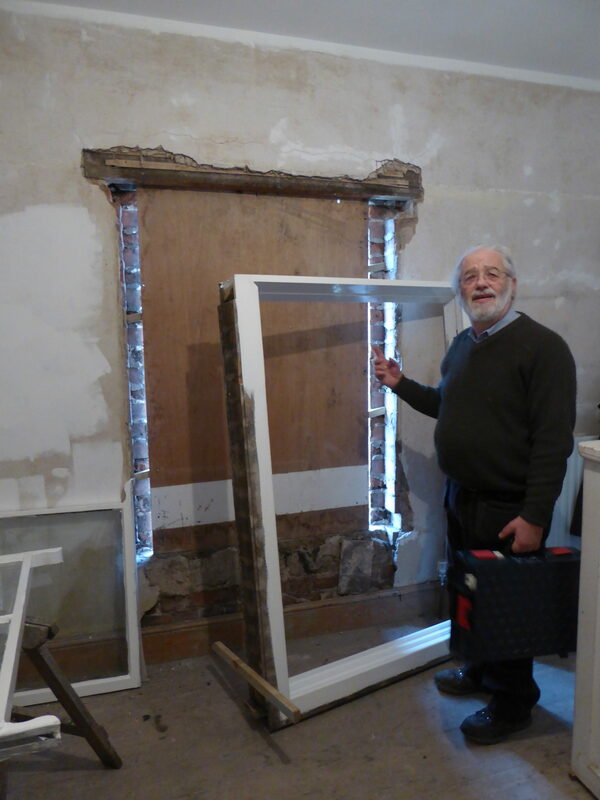 On the construction side of things…..
Dave has now put the finishing touches to the upstairs bathroom, Steve has reconstructed sash windows and the remaining front bedroom has now be made into a meeting room (available for all to use). 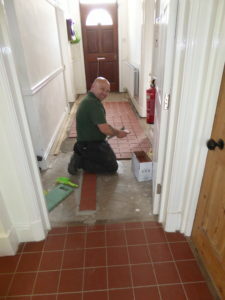 Downstairs, Darren has re-tiled the hall, with help from Dave & Roger so the house is now almost finished. 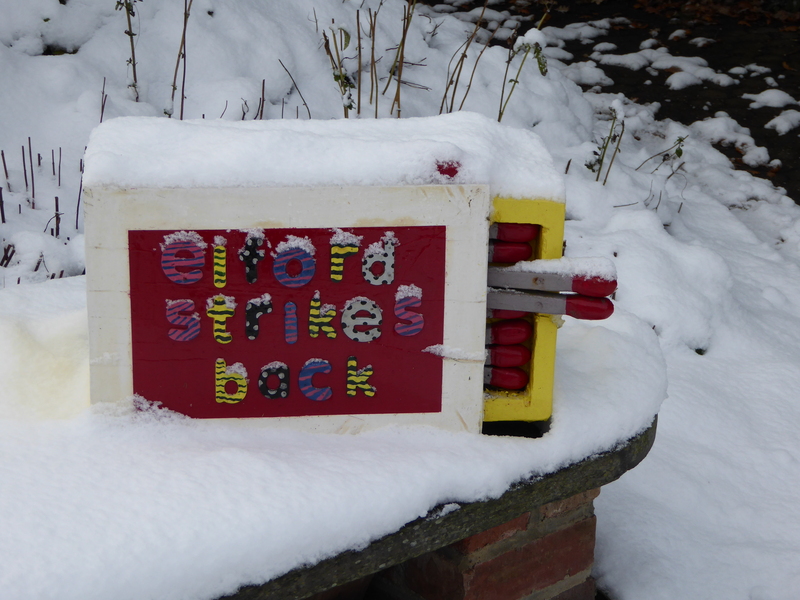 This winter we’ll tackle the stairs and plan to create a history time-line about the Elford Estate & Garden. I’ll be sending you a separate email about this to encourage YOU to get involved so watch out for it coming soon! 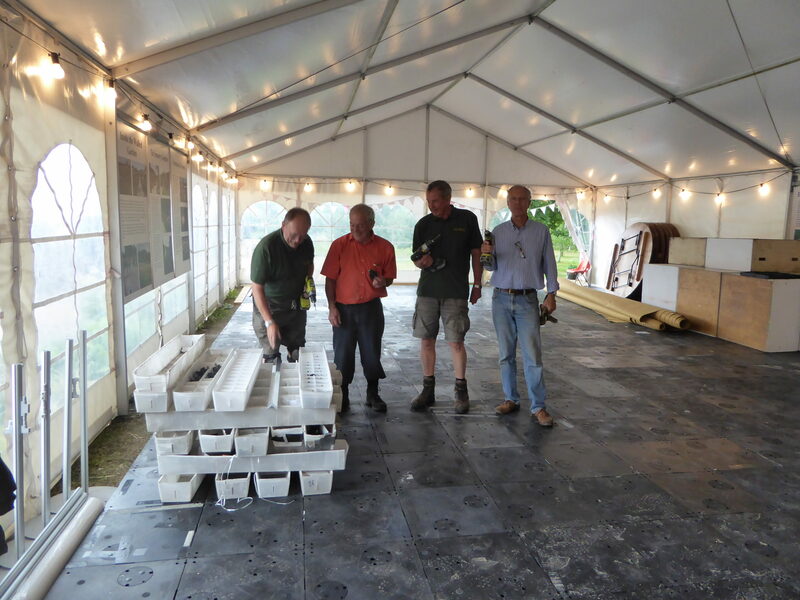 We have a new floor in the marquee! 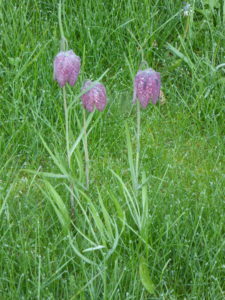 For years we have suffered after rain which has tended to seep into the tent, soaking the carpet. We have now been able to purchase a modular raised floor – the fitting team is shown above right – and it looks splendid with its new blue carpet. A kind donation by the Stewart Company of Banbury provided us with planters which Thelma has now planted up to finish the job off. Proper job, chaps, well done! The water pump in the water tower (above) was restored a few years ago but needed some special plumbing to connect it so that it would draw water from our well and pump it into the water tank up in the tower. With some experimentation and a new drive belt, it now works perfectly, thanks to Laurence! 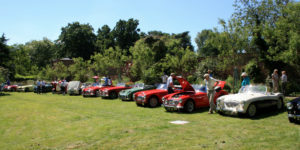 A coup for the garden in June was the arrival of a fleet of vintage Austin Healey motors for the club annual meet and judging. The sun shone on the gleaming chrome and glistening paintwork. The cars were pristine (inside and out!) and their proud owners keen to bend the ears of interested visitors. 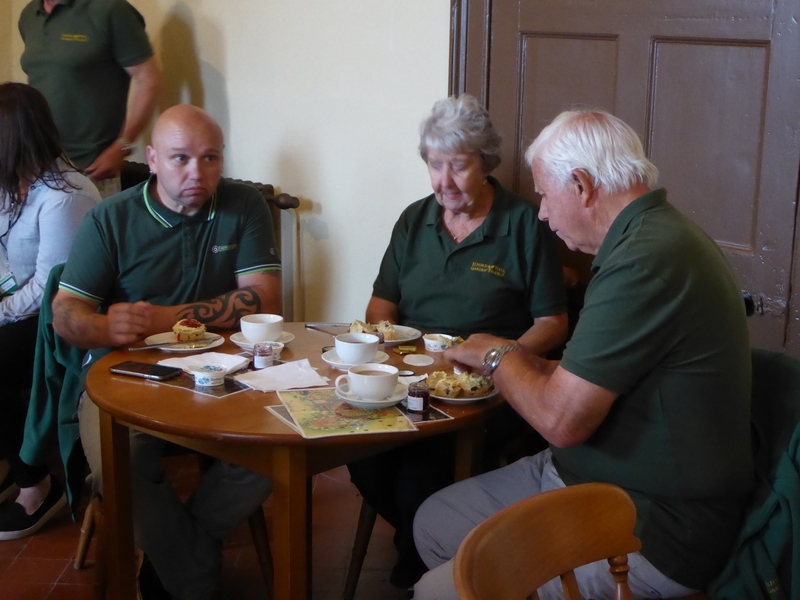 Advisors to the National Trust, that’s us! 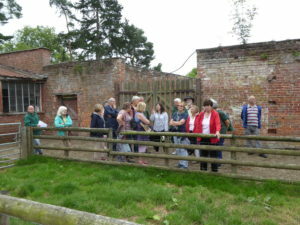 You may recall from an earlier newsletter, that we were visited by a fact finding group from RHS Berrington Hall who wanted some ideas to support their Heritage Lottery Fund bid for developing their walled garden. 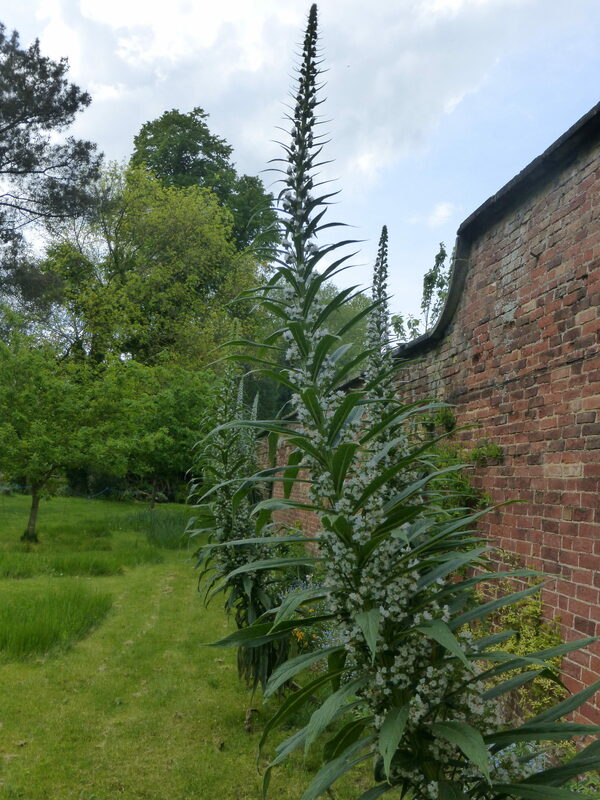 They offered to host us at Berrington Hall at their expense so a few of us went along to see what they were up to and to look over their walled garden. We had a great day out. 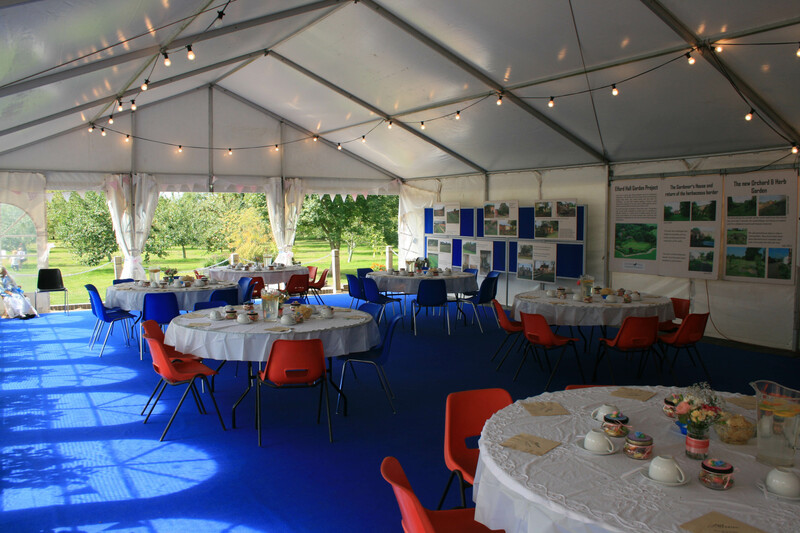 The weather wasn’t too bad (but not windy enough for the kite enthusiasts who had a big meeting there on the same day), we had a fascinating tour of a very different walled garden and to cap it all, they treated us to a lovely cream tea. 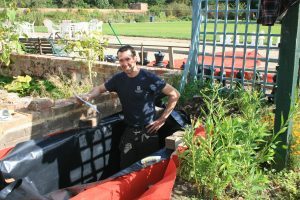 It’s not all work at the walled garden! 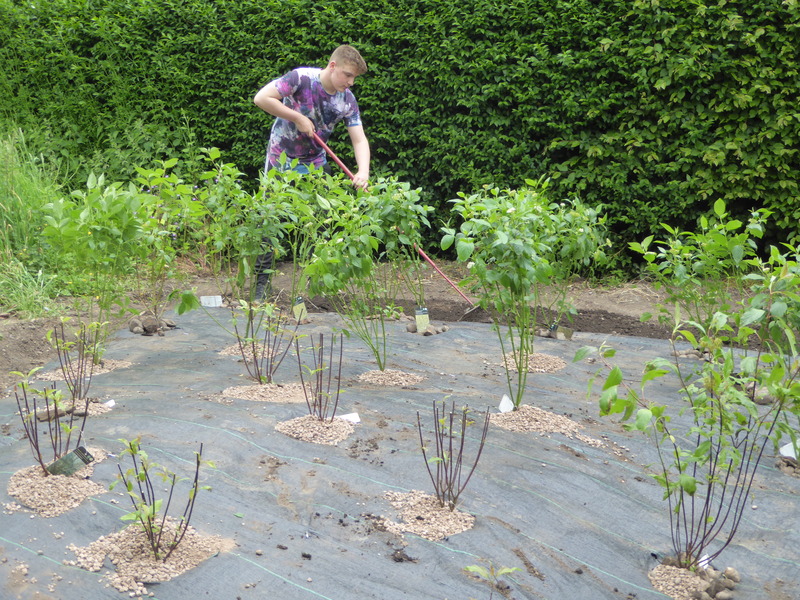 Here we are (below) in one of the sections of their walled garden which is used by a local farmer at the moment. Their walled areas are immaculate but only sparsely used compared to ours and they are maintained by paid staff supplemented by help from volunteers. Thanks to all those of you who took the trouble to complete and return the recent questionnaire. You will recall that we are trying to formulate a plan for the next 10 years development at the garden and your responses will be very useful in this task. Most replies indicate that we are working along lines that villagers support already (which is re-assuring) and ‘steady as she goes’ was a common message. The survey did throw up lots of good ideas for the future for Trustees to ponder. We have had one preliminary meeting prior to the questionnaire being circulated. The next step will be a meeting for those of you who expressed an interest in being involved in preliminary discussions and from this we hope a working party will emerge to produce a 10 year plan for the Trustees to consider (and hopefully approve) before sharing this with the whole village. 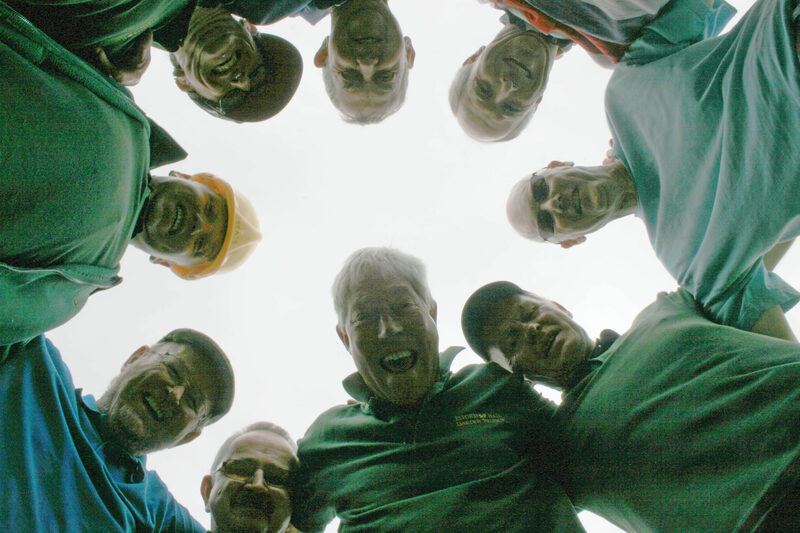 The current body of Trustees has now remained virtually unchanged since the project began and new trustees are needed to steer the project forward so if you think you could help, then please contact us to find out what’s involved. 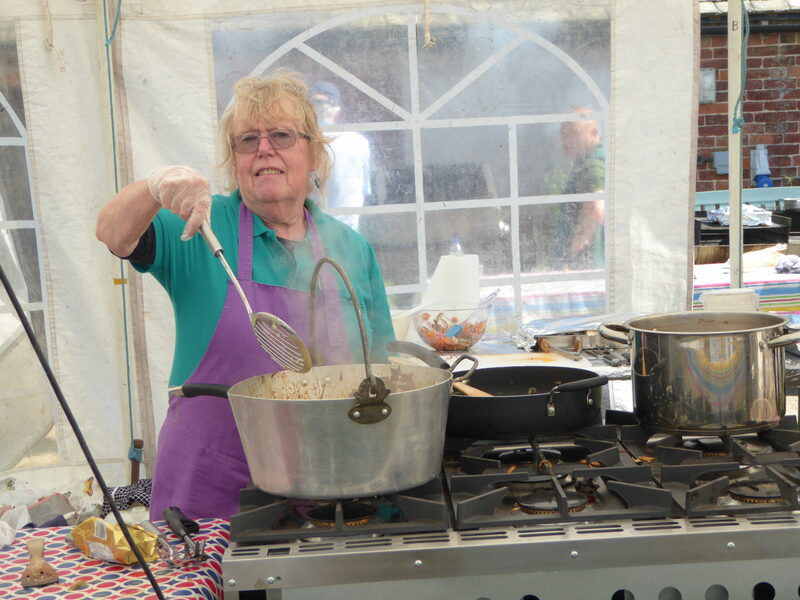 Gates open on the 2017 Festival at Elford at 12.30 on July 1st with music and hot food being available from 1pm onwards. This year tickets will be available on the gate at £6 for adults and £3 for children over 5 years old. 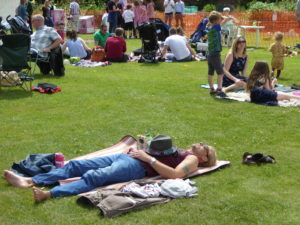 The walled garden is a lovely rural setting for this old-style village event and it’s a great day out for families with plenty of dry areas should the weather prove inclement! 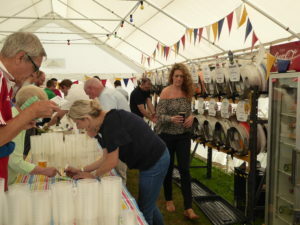 This year we hope to exceed the 20 real ales and 12 ciders that were available last year. A special treat will be a cider made from our own apples – you could be the first to sample it! Wines and soft drinks are also available, as are hot drinks. 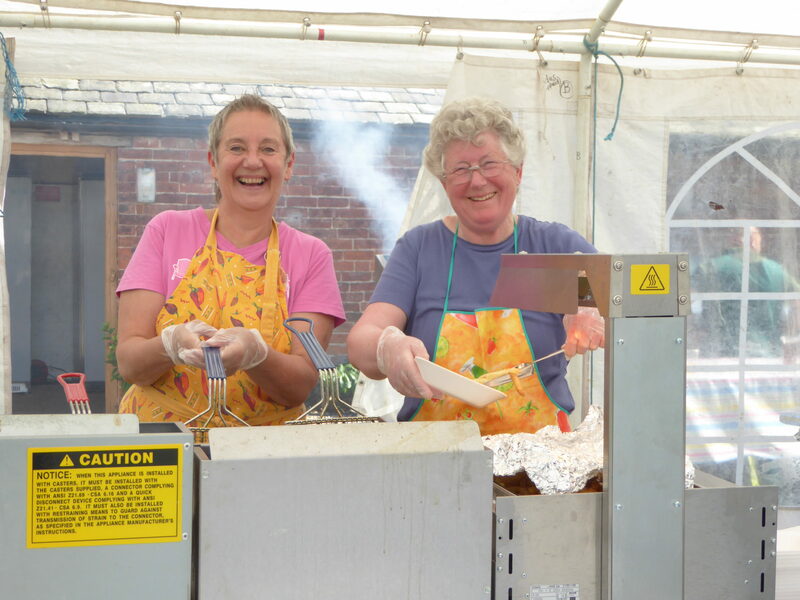 BBQ food will be available from 1pm, with chips, a special vegetarian option and a hog roast in the evening. Cream teas will be available too! For the first time this year, locally made speciality ice creams will be on sale. There will be special free fun and games for kids so parents will be able to relax and enjoy their day. The music will cover a number of genres and will continue late into the evening. 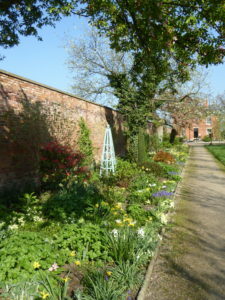 Spring has well and truly arrived and is fast edging into summer at the Walled Garden. 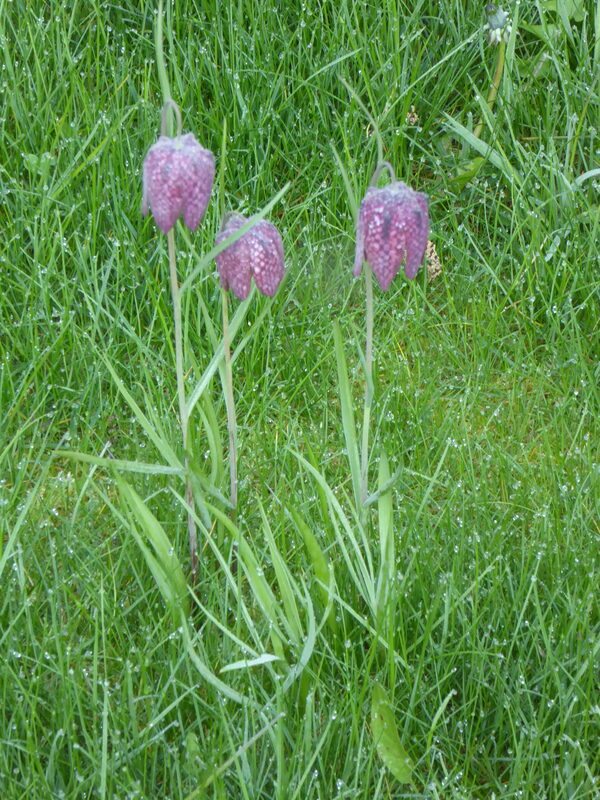 The grass is beginning to enter its sprinting phase and the ‘weeds’ are looking in great health. The bulk of the spring bulbs are now over, though the bluebells are currently looking fine – so don’t miss your chance to visit and admire them. The rhododendrons are flowering well in their new position by the river and plants in the herbaceous border and the sensory garden are coming to life after their winter slumbers. 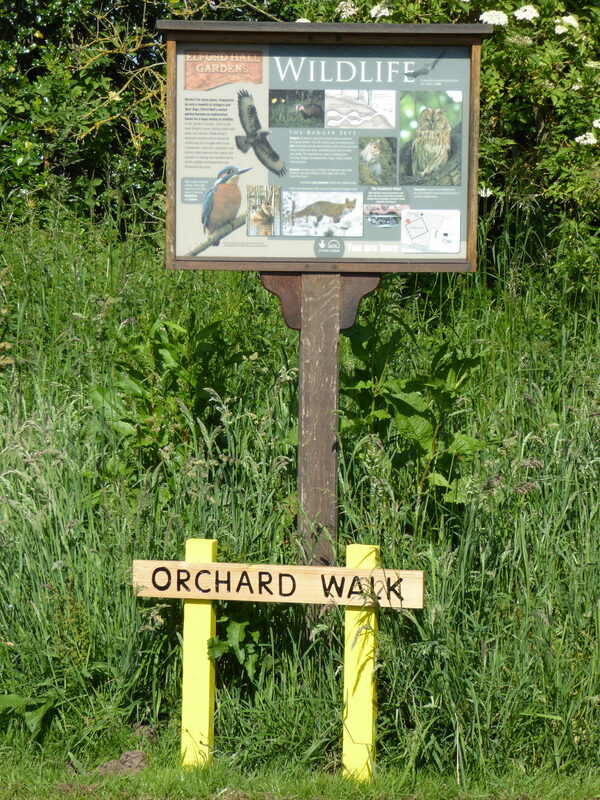 The orchard blossom has been great – and still is on some trees – promising a healthy harvest in a few months time. The trees are bursting into full leaf now and it’s amazing just how many greens there are in the fresh young leaves. I love this time of year in the garden – there is so much to see, so it’s a good time for a visit. It’s a time for blossom and butterflies – already we’ve seen commas, orange tips and brimstones ……. Sunday June 18th – Austin Healey Owners Club rally and judging – all day – a real treat for all you car enthusiasts. Why not bring a picnic? As usual, winter has given us the chance to tackle some of the bigger jobs before the need for summer maintenance becomes the order of the day. 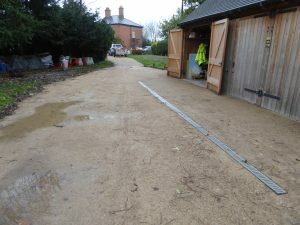 New drainage has been laid in front of the barn where winter water seems to enjoy collecting. 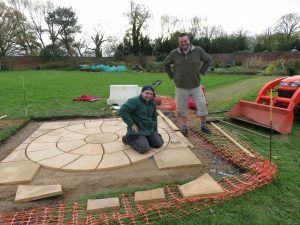 Mike (right) and Darren have re-laid the stones around the pool in the sensory garden and Peter is in the process of removing the flaking paint ready for a summer spruce up. 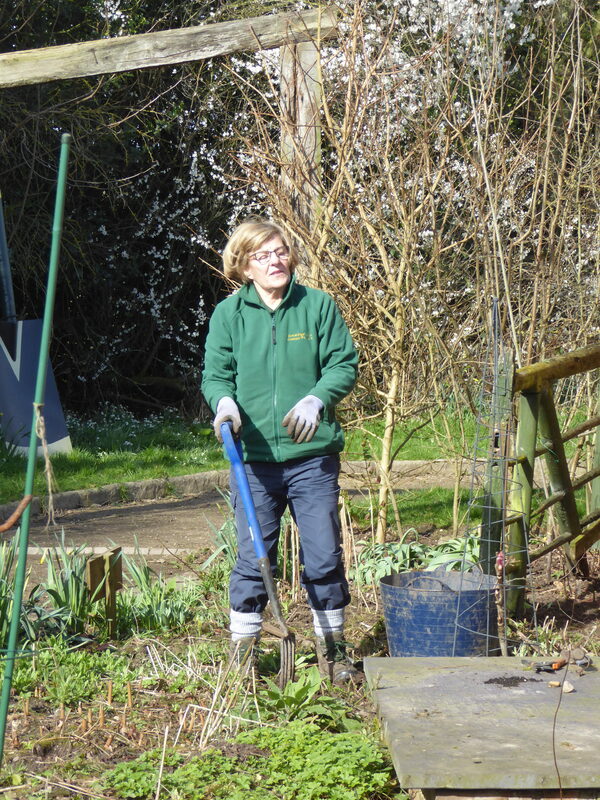 Mitzi (below) and Roger have been busy weeding in the sensory garden and Jean, Dorothy and Beryl have tackled the borders inside the walled area. Peter Stubbs is getting on top of the allotments and Pat has the herbaceous border looking nice already. Thelma’s plant nursery is looking good and there will soon be plenty of plants on the produce stall! 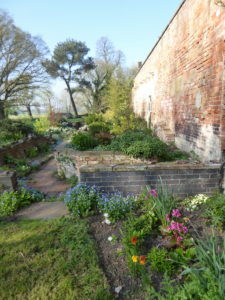 Behind the house, Barbara & Michael have done a great job on the flower beds – as the next photo on page 3 shows. Inside the house, Steve and Dave have been rebuilding the sash windows and the bathroom should soon be operational again. 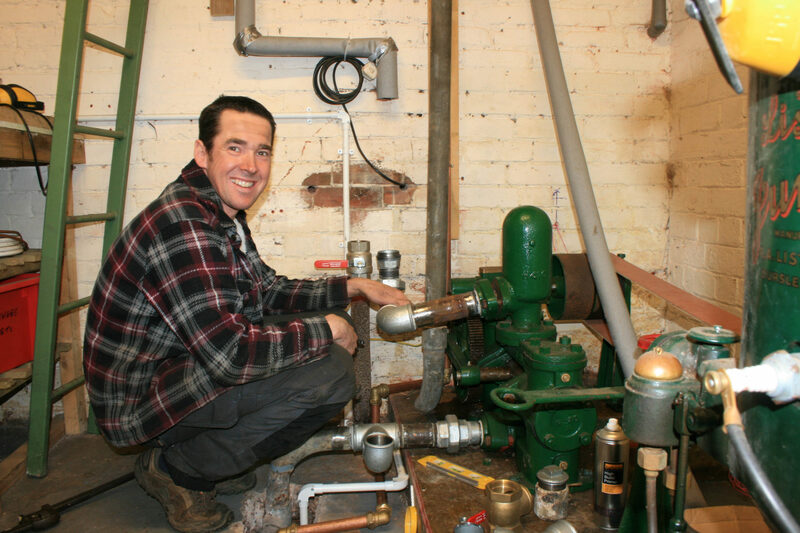 Dave has also done good work in the bothy, making the small kitchen space work more efficiently and making it easier to keep clean. Everyone is very busy and working hard to keep the gardens looking good for daily and occasional visitors! The boules season began with a ‘bring & share’ meal in the bothy and nearly 30 people attended and a great time was had by all on a lovely spring evening. 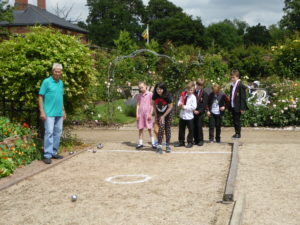 There was some boules played but match evenings really began on April 21st with another good turnout despite the cool evening! This augurs well for the season. We meet on the 1st & 3rd Fridays of the month and no experience is necessary – just bring a picnic and join in. A new ‘club’ has been born in the village! A group of creative enthusiasts (see right) have been working on a wall hanging depicting life in Elford in 2017. 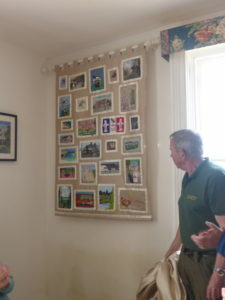 The hanging was unveiled by Dave Watton during April (see below) and now hangs proudly in the Gardener’s house. You should call in and view it! It’s really good!!! 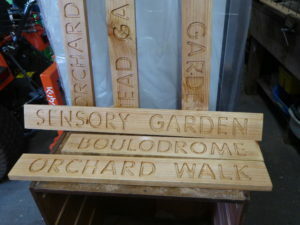 Their next project will be to do a Walled Garden alphabet and they are looking for people to join in and help so if you are interested, ring Sue on 383592 for information. “It was dark but mild as Loz and I walked up to the walled garden at 8:00 pm on Saturday 18th March. First to be picked out in the beams of our head torches were woodlice and millipedes crawling up the crevices in the bark of an old lime tree, an invertebrate rush hour. Pipestral bats flitted in and out trees that line the Avenue with one or two close encounters from those that should have gone to Specsavers. Night crawling worms were out in their hundreds in the grass, bronze bodies swaying in our lights, whilst half their length remained in the soil. Lots of frogs sat motionless in the pond by the Boat House. A perch with a stickleback in its mouth was seen, looking like it had bitten off more than it could chew. A multitude of small fry swam in the entrance to the boat house, oblivious to the pike that that is often to be seen loitering under the staging. Walking on to the ponds in the sensory garden, our lights picked out at least six newts coming up for air before diving down once more into the murky depths, panicking the water boatmen on the surface. A handsome toad stopped us in our tracks. We picked it up and introduced ourselves before letting it go on its way. In the field opposite the boat house the call of the peewits was quite beautiful, accompanied by the high pitched whistle from neighbouring teal. A fox crossing the field behind the Gardener’s House, let out its blood curdling scream to some unseen mate and in the distance badgers could be heard having a bit of a domestic! We left them all to it, just amazed at how many wonderful creatures we had seen or heard in less than a one hour stroll, and all in the dark! 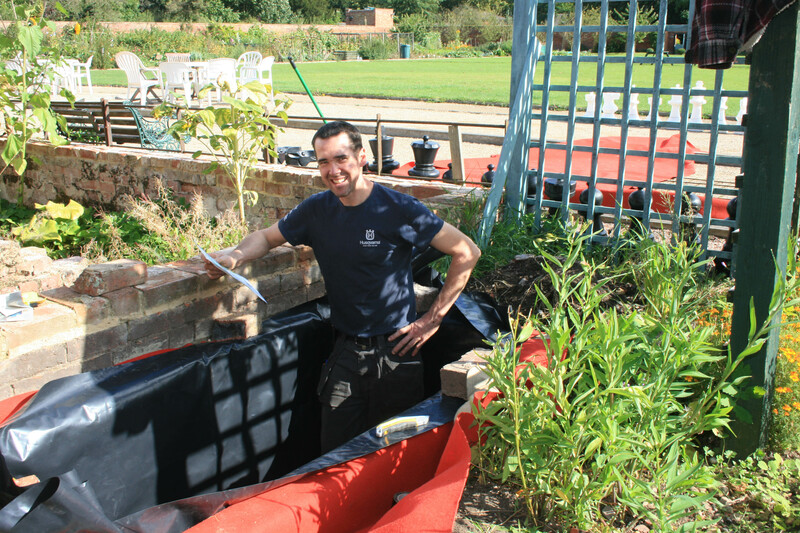 We had a visit from the National Trust in April – they are restoring a walled garden and wanted to pick our brains! What an accolade!!! On Saturday June 17th we will be visited by the Cheshire Gardens Trust and appear in their glossy magazine – another accolade, I think! We’re in the same issue as the Imperial Gardens of St Petersburg! 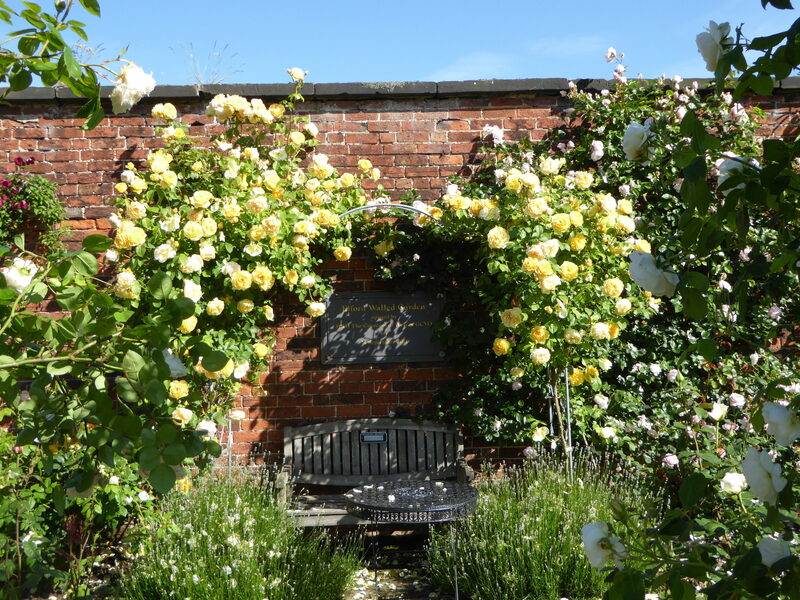 Membership Secretary – someone to process the application forms of new ‘Friends of the Walled Garden’ and to process annual membership fees when they become due each April. This is a relatively small task during the year with a slightly busier time in April when subs become due. This post could be combined with Gift Aid secretary. 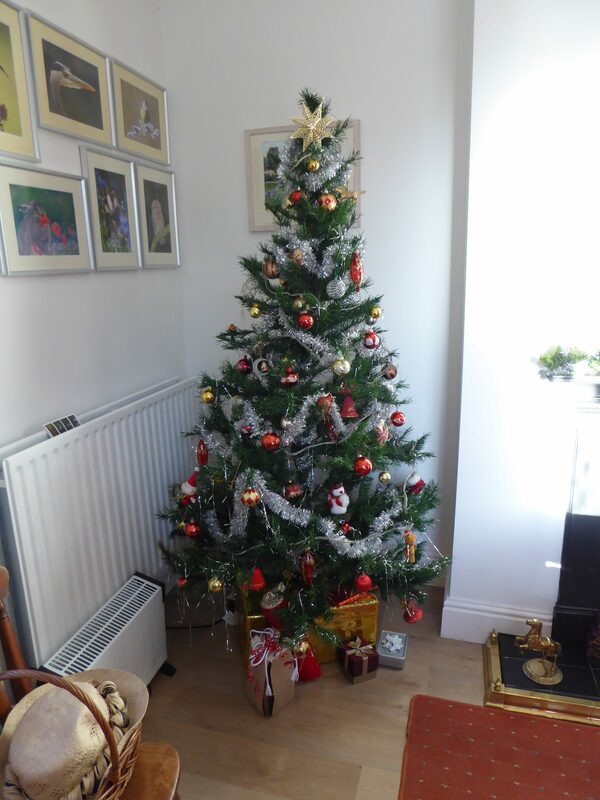 Gift Aid Secretary – someone to apply online to the HM Revenue & Customs annually for the tax refund in respect of gift aided donations to the project/subscriptions. This can be a once a year job and will involve being registered with HMRC as our representative and could be combined with the post of membership secretary. Event Cashier – someone to deal with the money side of things at annual fundraising events like the beer festival. This would involve distributing floats for events, dealing with event money on the day and accounting for takings and return of floats. The Elford Walled Garden project is approaching the end of its first 10 yr plan. Work so far has mostly been concerned with the creation of the community asset which we now all enjoy following construction works across the site repairing, restoring and creating the facility we now have. Almost all objectives originally set have been hit or bettered and the project’s success is widely recognised. The charity is currently sound financially. The project is blessed with a committed team of volunteers whose continued efforts have created the asset of which we can all be proud. 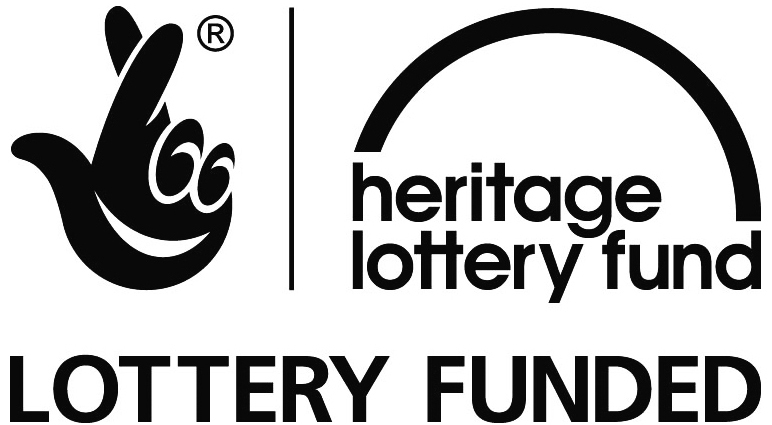 Over the next 10 years, the Trustees feel that the Project will be moving towards a period of consolidation of what has already been achieved when the general upkeep of the site will be a priority. There will still be a need to raise funds to cover running costs and to cover expenditure on any new ideas. The Trustees would like to set out a strategic plan for the direction the project will take over the next 10 years and would like to involve as many people as possible in the process leading to the formulation of this strategic plan. The Trustees would like to encourage villagers to take the up the opportunity to contribute to this planning phase. 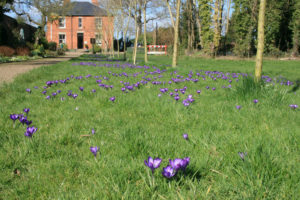 The Trustees realise that a wide range of opinion about the value of the walled garden will exist within the local area. Whilst the walled garden is generally an asset to the village and the villagers, as with all things, some people may think it also has negative impacts. 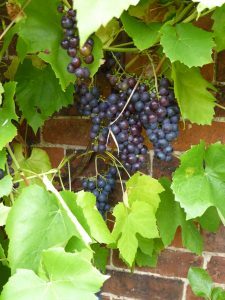 Therefore, Trustees would like to encourage villagers to have some input into how the garden might develop in the future and to give villagers more involvement in how ‘their’ walled garden is likely to develop. The Trustees plan to work towards a 10 year strategic plan for the Walled Garden. Over the coming months, to achieve this, Trustees intend to hold a series of small group discussions with interested parties and to gather ideas and opinions through a village questionnaire to every household and to all ‘Friends of the Walled Garden’ to help them formulate this strategic plan. This will hopefully throw up fresh ideas and involve the whole village more fully in future developments at the Walled Garden. There is an opportunity for interested parties to become trustees of the Elford Hall Garden Project and so help guide the project on its journey forward. This is not an onerous task and simply involves attendance at 6 meetings a year. Some trustees have specific roles (eg chairman, secretary, treasurer) while other trustees have no particular portfolio. If you would like further information then please indicate this on the questionnaire below. 4. 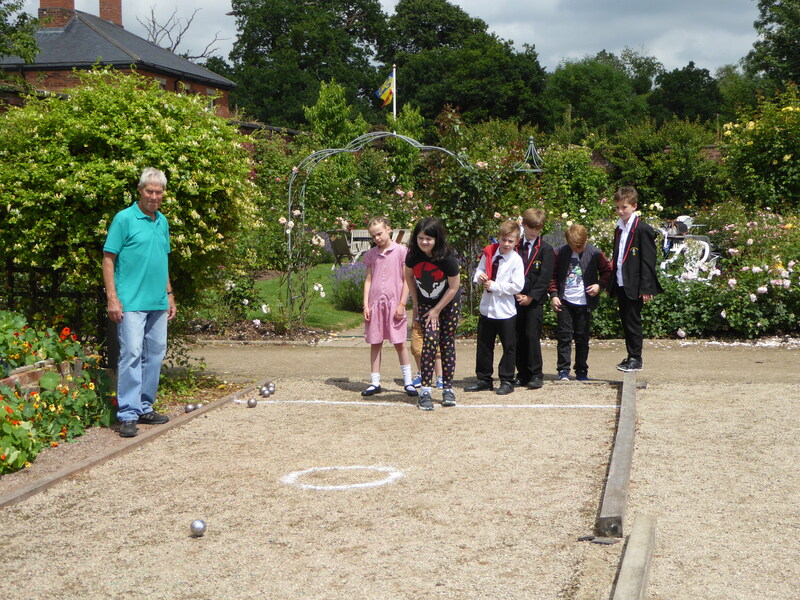 What activities do you undertake when you visit the Walled Garden? 7. 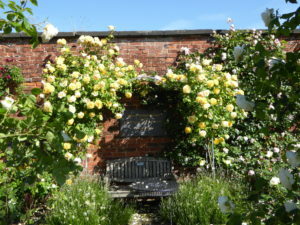 What do you see as the positive benefits of the Walled Garden? 8. What do you see as the negative impacts of the Walled Garden? 9. How would you like to see the Walled Garden developing in the future? The 2017 Beerfest will take place on Saturday July 1st at the walled garden in Elford. Gates will open at 12.30pm and the event will extend into the late evening. Music will be provided throughout by local performers and food will be available all day, including a hog roast in the evening. There will be the usual free activities for children and a wide variety of craft beers and ciders will be available as well as other refreshments. More details to follow….. 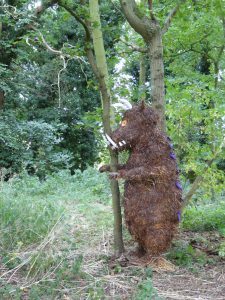 The Trustees of the Elford Hall Garden Project have decided that there will be no bonfire event in 2017. 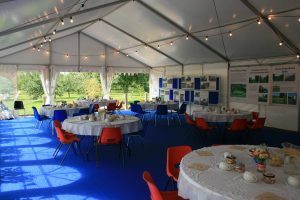 This event has been very popular and its cancellation will disappoint many but the decision has been taken in the light of Health & Safety concerns highlighted during the 2016 event and also in view of the huge amount of work that is required to stage such an event at a time of the year when weather is often inclement and when working days are short. It may well be that the event will be held in 2018 so watch this space. 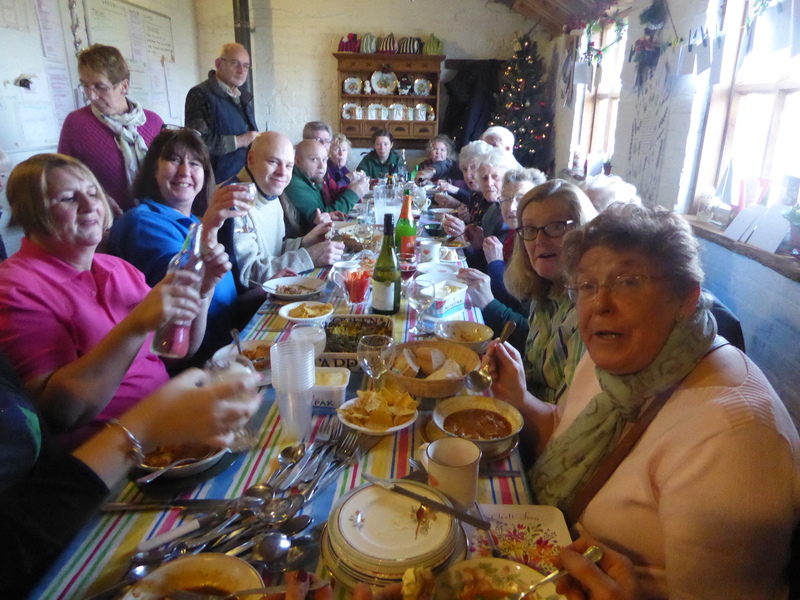 Christmas came and went, the ‘live’ nativity in the stable on Christmas Eve was a great success as usual and the volunteers Christmas lunch in the bothy was well attended and enjoyed by all who were able to attend – with far too much being eaten and drunk. It was, however, a nice way to end a successful year of hard work at the garden. January saw the ‘nice’ winter weather continuing but then along came February which brought fog, frost, wind and rain in rapid succession and this made working outside unpleasant though there is always lots to do at this time of year, preparing for the coming spring. There seems to be endless pruning to tackle and much manure to spread and all at a time when indoor jobs seem so much more attractive! The longer days and occasional sunny spells have encouraged the spring bulbs to emerge from their winter slumbers. A few brave crocuses have appeared but the snowdrops are a delight and bring a smile to the face with their promise of better things to come. 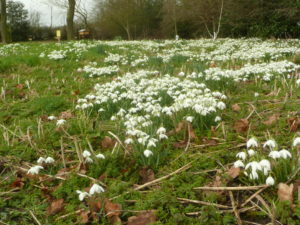 It’s a bit muddy underfoot still but the snowdrops are worth a visit if you need cheering up! Even in the depths of winter there are nice things to see at the garden. 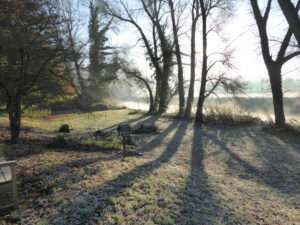 Below, a frosty misty morning by the river was a delight to Roger and others, who were clearing nettles and busily creating 2 new shrub beds on the river bank. 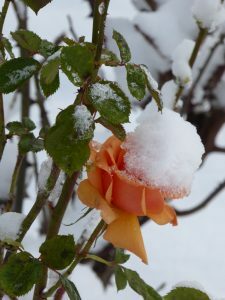 All of the shrubs planted should flower if they have survived the winter chills and give pleasure for many years. 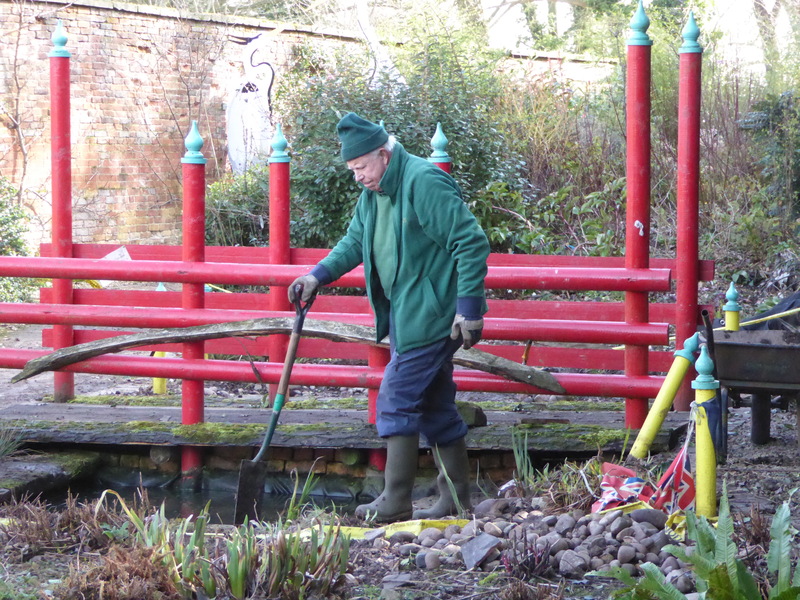 Mike and Darren have been busy shoring up the sides of the ponds in the sensory garden which have collapsed this year; leaves have been raked up (and there have been a lot to rake!) and allotments are being prepared when ground conditions permit. Thelma has been busy preparing plants for sale in spring and Peter Kennedy – as always – has been industrious in the barn. Sue Watton has kept us well fed and watered while somehow managing to garden at the same time and Angela continues to keep tabs on our spending – a seemingly endless task. People sometimes ask me “Are you doing anything at the garden at the moment?” I think of the long list of jobs on the noticeboard in the bothy and I smile weakly. “ We try to keep busy,” is my usual response. The irony in my voice is often lost! 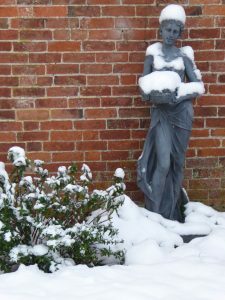 For those of us with a more sensitive disposition, the winter is a great time to focus on what needs doing in the house (where it is at least a little warmer!). 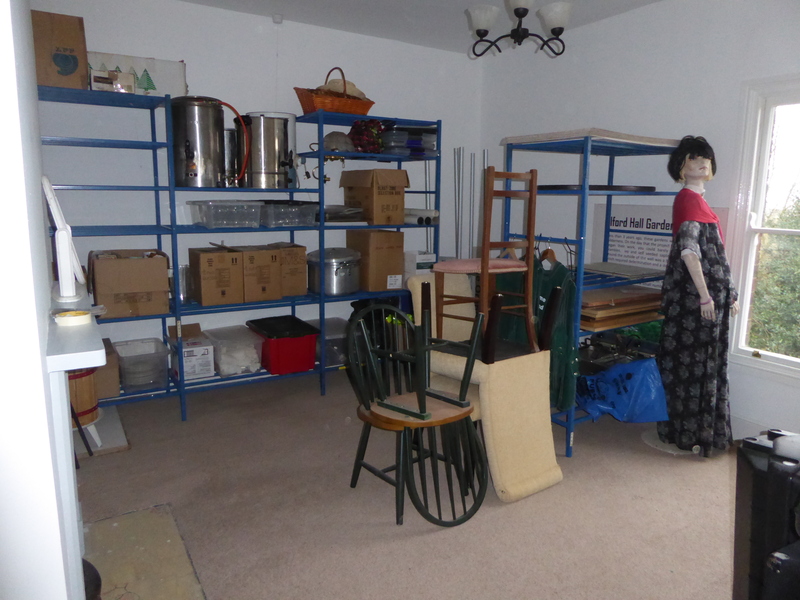 The final touches have been put to the rear bedroom which is now a storeroom. The window was rebuilt and the fire surround painted and the carpet laid to finish the job. The painters then began work on the final front bedroom. Steve Eyley has today refitted the rebuilt sash window so that we can now finish painting the final wall. Roger started tiling the bathroom today – it’s the last upstairs room to be tackled. Hopefully, this will be well underway before spring is too far advanced. Pete has also been working on repairs in the bathroom. Downstairs, there is a little work to be done in the hall and then new floor tiles to be laid. Once this is done, we can move outside to paint the shabby woodwork which has been neglected for so long. 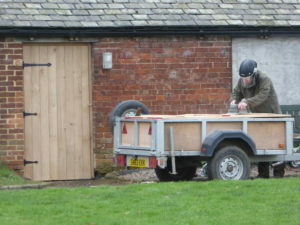 Elsewhere, Dave has fashioned two beautiful oak doors for the bothy building so that this is now weatherproof. Just the window frames to make and then we can begin to think about the inside of the buildings and how best to use the 2 rooms. Above we see the first door already hung and looking fabulous while Dave does the final sanding on the second door. This annual meeting is always productive. Our volunteer team always surprises us with their ideas and we now have a long list of things to tackle in 2017. Some things have already been done – would you believe – but the long list is displayed in the Bothy for you to look at……. 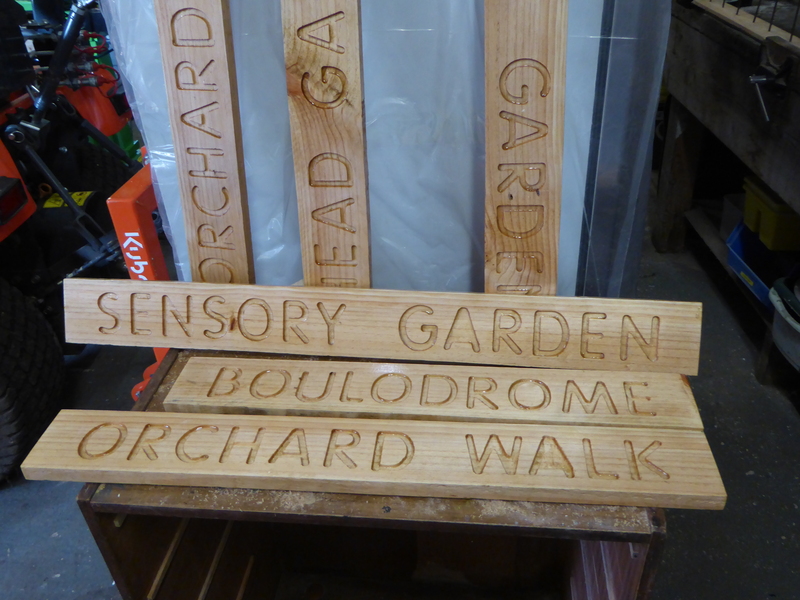 Already done – log splitter purchased, new refrigeration purchased, orchard ladders purchased, new signs made. Taken on board – redesigning the bothy kitchen to make it easier to keep clean, better seating for the rose garden and hard standing for the area outside the barn. We’re going to be pretty busy by the sounds of it! Laurence has set up a camera overlooking the wildlife pond which links to a TV screen in the Bothy so the wildlife can be observed in comfort! We’d really like to have a few more volunteers helping to keep the garden running – particularly people from the village. Many hands make light work so if you could spare an hour or so from time to time then that would be great. In addition to gardeners, we would welcome help from people who can handle a bit of book keeping, painting and decorating, light building, cleaning and/or helping with refreshments for volunteers and for visitors. Contact Roger or Dave for more information. 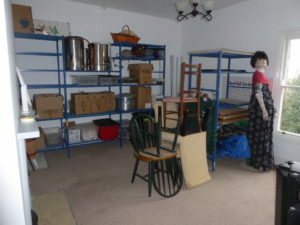 Rooms are available in the house for the use of villagers for meetings etc. Contact Roger or Dave for more information or contact via the website. The library in the house is still in operation and being enjoyed by many. It is FREE. Village Forum coming to a walled garden near you! When the Elford Hall Garden Project idea began some 10 years ago, the steering group at that time presented their case to a village meeting and this ultimately led to a 10 year plan which is now coming to an end. The overgrown jungle has been transformed into a lovely community park, the envy of many. The original objectives have been addressed and mostly they have been achieved or exceeded. 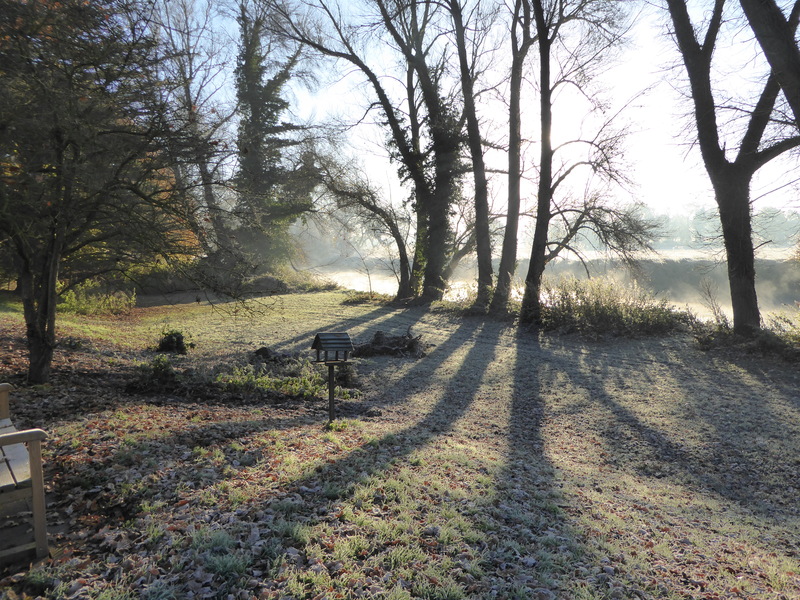 The Trustees now feel that the time is right to move towards a plan for the next 10 years and feel that it is only proper to encourage the village to make its voice heard – after all it’s everyone’s community park! To this end, the Trustees plan to arrange a number of small meetings in the gardener’s house during the coming months to generate discussion and ideas to help formulate the plan for the next 10 years. Space within the house will limit numbers at each meeting, but if you would like to be involved in this forum then please contact Dave or Roger for further details and to get your personal invite. 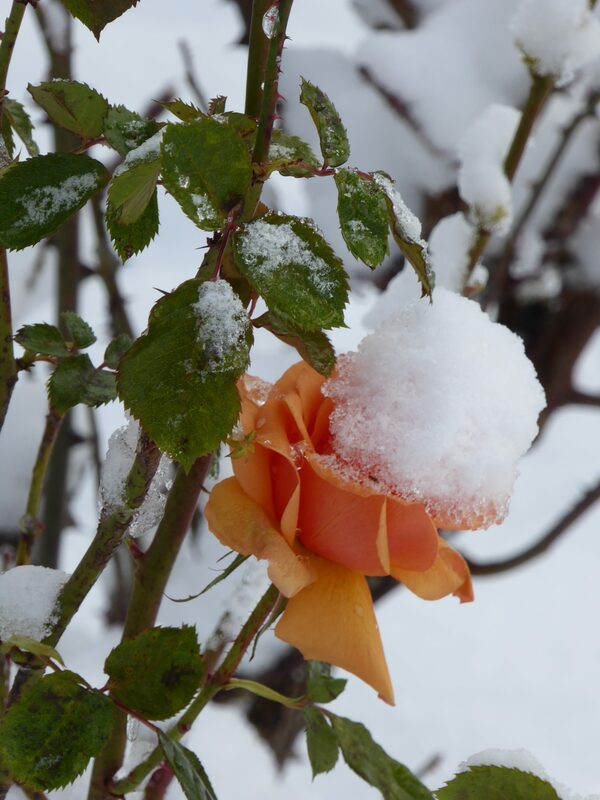 Wishing you all best wishes for a super spring….